If you follow my blog, you know I share topics about Yosemite. For today’s post, I am trying an experiment suggested by the Ultimate Blogging Challenge on Facebook. With proper sourcing and credit, you can share reprints of articles found on EzineArticles.com. Throughout this post I have made several comments. The photos are my own. By Stephen Plut | Submitted On December 19, 2014 for EZine. Reprinted. My first visit to Yosemite was in 1997. I had taken my dad to Montana backpacking twice and thought it would be nice to expand our experiences. Being complete newbies to the park we were totally blown away by the beauty of the park. We had flown in to San Francisco from Pittsburgh and after a day there we headed to the park. The view of the valley as you head into the park is awesome and I could see why people fell in love with Yosemite. Our original plan was to hike up to little Yosemite Valley and then climb Half Dome via the cables. This turned into a learning experience for us as we learned the cables hadn’t yet been installed (it was mid-May) which ruled out climbing Half Dome. COMMENT: Reservations are required for treks up to Half Dome and a lottery system is firmly in place. We then went looking for a Plan B but our options were severely limited due to the damaging floods the park had endured earlier in the year. It quickly became apparent that we could either hike to the top of Yosemite Falls or have to settle for just doing day hikes. Looking at the trail up to Yosemite Falls did nothing to make us feel good about our decision. Staring up at what seemed to be a straight up ascent, we wondered if it was doable. After a sleepless night we headed off from the trail-head early the next morning hoping to not fall off the mountain. Fortunately, the vastness of the western landscape had masked what was actually a well designed trail. There was no imminent threat of falling but the loose rock added to the already difficult climb. From trail-head to the top of the falls meant climbing 3,000 feet in approximately 3 miles. If you haven’t hiked that sort of altitude gain it is hard to appreciate how much effort is required. After about half a mile, the trail runs parallel to the valley floor as it turns right and heads towards the falls. This is definitely the easiest part of the trail and the payoff is an amazing sight. You come out of the tree lined area right beside where the upper falls and lower falls meet. I remember standing there with the roar of the falls directly behind me. Note: if you hope to see the falls running go in May or early June. The tons of water cascading down from the upper falls slamming into the rock and then continuing on down the lower falls has to be seen up close to be truly appreciated. As we have found with many areas within Yosemite we were transfixed by the power and beauty. We could have spent hours there but our destination was at the top of the falls a long steep climb yet to be conquered. From the split of the falls we started up a long see I ever ending series of switchbacks. We were carrying full packs not just day packs so our degree of difficulty was pretty much as high as it could be. The frustration of going back and forth on the switchbacks only gaining a few feet in altitude tested our patience. Still we persevered as the sun rose higher in the sky and the temperature started to rise. As you depart the split in the falls, you head left into a bowl made up mostly of rock and brush. You can see the top for a long, long time, yet as the minutes and hours went by our progress seemed negligible. We had started at daybreak and now it was 2pm. Our progress was slow and we’re only half way up the bowl. As we climbed, our view became more and more spectacular as we rose above Yosemite Valley. The view helped us keep up our morale and we pushed on. It was 4pm when we stepped over the top and onto level ground. What a feeling of accomplishment particularly for my father who was 70 years old! We had a celebratory drink of water and then headed up the creek to look for a spot to setup camp. Just after starting out we ran into a young man sitting on a rock. He was the first of many characters that we have subsequently met in the park. We commented to him about how ill-prepared many of the people hiking up to the falls seemed to be. Many of them were in flip flops or tennis shoes with no food and worse yet, no water. The young man agreed and said that was actually why he was there. He earned money letting people borrow his water purification pump at $2 per use. You have to love American capitalism. COMMENT: I find this a little hard to believe. If a Park Ranger saw this type of behavior, this guy charging for water purification would have been shut down, unless he was an approved vendor for Yosemite Park and Curry Co. Also when you take hikes in the wilderness, please be prepared with proper clothing, shoes, and water. Many first-time visitors hop off the shuttle buses and attempt to hike on trails that can be treacherous. After saying our goodbyes to the water capitalist we continued upstream until we found a beautiful camp site. The site was on level ground with a nice bed of pine needles for the floor of our tent to rest on. Our site was close enough to the creek to hear the powerful yet soothing rush as it neared the plunge over the falls. By the time we had our camp set up the sun was going down and the temperature started to plummet. COMMENT: Unless they had a back country permit (for fire), they could not just camp there. Nowhere in this post did I read how they acquired backpacks and gear for camping atop Yosemite Falls. The next morning it was just above freezing when we left the tent to prepare our breakfast. That’s the thing about most all back country places in the western United States. If you go in May or September (our preference due to less crowded conditions) you can expect cold mornings followed by gradually rising temperatures dipping back down as the sun sets. COMMENT: This is true. The valley can be very hot during the day, reaching summer temps of 90+ degrees and nights dipping into the 40s. The fluctuations in temperature are due to the very dry air. Again, be prepared for weather and for goodness sake, wear sunscreen! After breakfast we hiked over to the edge of the mountain enabling us to look down at the falls from above. What a view! Not only could we see all of Yosemite Valley, but Half Dome was directly across the valley from us. We lingered on the ledge for an extended time mesmerized by the beauty of Yosemite. We finally broke out of our spell and hiked along the ledge further up the valley. We spent the entire day up there saying very little; just soaking up what has to be one of the most spectacular vistas in the world. We spent 3 more days up above Yosemite Falls exploring along the creek and the forest. When we started down I knew the place had hooked me. I didn’t know when but I was certain that we would be back. COMMENT: I doubt they really camped there for three days. 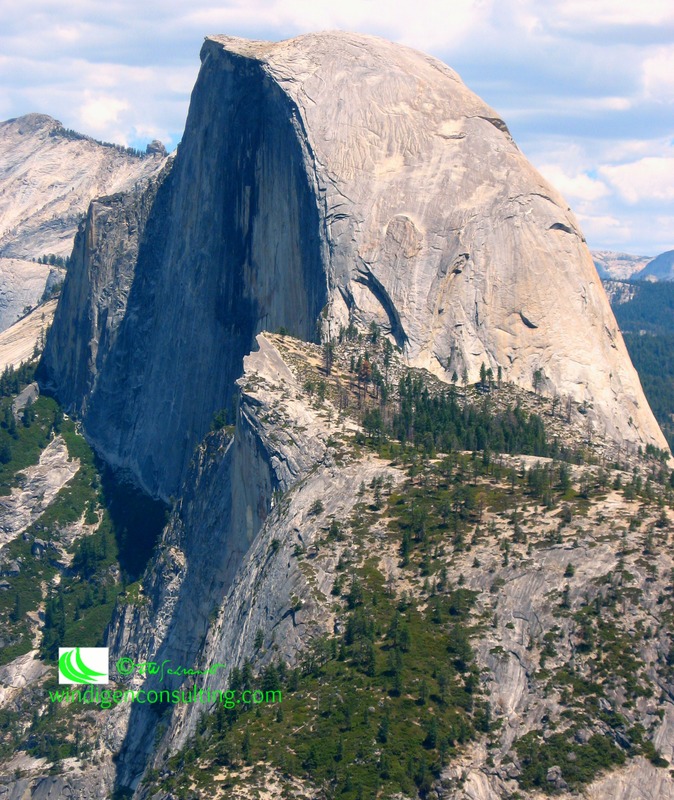 I enjoyed the author’s perspective of his first time visiting Yosemite Valley. I prefer writing my own content, and I could have just as easily written a post about my first visit (although I would have been eight years old my first time visiting). But the idea to use Ezine for curating content to enhance your own is a great idea. I did have to correct several grammar and spelling mistakes because I do have high standards for what I publish on my blog. Some of the author’s experiences may be imagined due to the strict camping rules of the National Park. And Rangers do patrol the trails. Carefully read the article for errors in grammar and overall writing. If you know the subject well, or are an expert, you should carefully select the EZine article and be sure that facts are accurate. In this case, I feel the writer used his imagination to enhance his story. Get ideas from EZine but perhaps write your OWN post, using the article as a reference or source. I would really love to hear what you think of using articles as reprints on your blog. Has anyone done this yet? If so, what do you recommend. Please share your comments, and thanks for reading! Dear Dock: What if You Never Existed? I’ve never heard of EZine and the idea is interesting but I agree with the points you mentioned at the end of this article that you must proofread and/or fact check the article — and it’s a good idea too to use an EZine article as an inspiration for one’s own post. Thank you for introducing this option to us! I’m impressed with your knowledge of this beautiful park! Yosemite seems breathtaking! I have only been to Yosemite once, but I loved it! It was so pretty! I loved reading this, especially with your comments. I’ve never been to Yosemite but it’s definitely on my list. I’m glad you commented and put things into perspectives. Great pictures! Thanks, SJ, for noticing the comments. It was hard to read this fellow’s story knowing what I know about Yosemite. I hope I wasn’t too critical. Hope you get to go sometime! I enjoyed the story very much we have been to Yosemiteand I have pictres. I actully prefer to write my own comments. That was a story from EZine. My comments are in green. Yosemite is amazing isn’t it? When lived in Washington state we were close to both. St Helens is very different after the eruption.